Synopsis: In a dystopic and crime-ridden Detroit, a terminally wounded cop returns to the force as a powerful cyborg haunted by submerged memories. 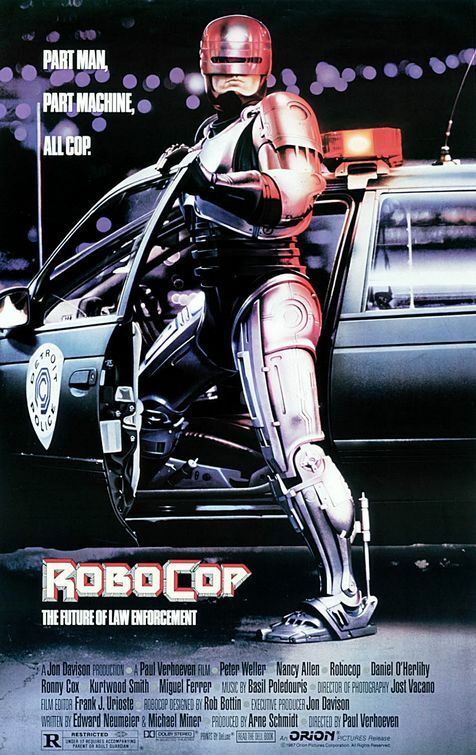 Review: Released in the summer of 1987 on the same day as Jaws: The Revenge and a re-issue of Snow White and the Seven Dwarfs, RoboCop was a unique package that landed at the right time amongst the larger studio fare being offered. Keep in mind that this was also the summer of The Untouchables, Predator, The Witches of Eastwick, Spaceballs, and Dirty Dancing (are you nostalgic yet?) and if you comb through the other films released that year you’d be able to tell why Paul Verhoeven’s dark comedy sci-fi was able to make its way to the fifteenth highest grossing picture of the year. Yeah, I called RoboCop a dark comedy…because there’s ample amount of wink-wink-nudge-nudge references to pop culture and the changing face of news as entertainment. Peppered in between the story of a cop killed in the line of action reborn as “Part Man, Part Machine, All Cop” are hysterically lampoon-y commercials and the kind of graphic news footage that still wouldn’t be accepted in today’s society. Casting Entertainment Tonight television personality Leeza Gibbons as a news anchor was a nice touch in riding the line between hard hitting news and the carefully lobbed barbs at the kind of fluff stories Gibbons was accustomed to dishing on. Comedy aside, its remarkable how ahead of its time the film was. Though some of the effects don’t play quite as well nowadays, it’s still a very watchable action/sci-fi film thanks to Verhoeven’s gonzo direction and the sleek special effects.make-up from Rob Bottin. Admittedly, the plot is a bit thin from screenwriters Edward Neumeier and Michael Miner, never really building upon its own original concept. It feels half-baked and not as fully thought-out as you may remember it being. Peter Weller makes for a nice leading man even though the top half of his face is obscured for much of the middle half of the film. A last minute replacement to the cast, Nancy Allen would get more to do in future RoboCop installments (none of which are half as good as this) so here she’s regulated to a Girl Friday role more than anything. As far as 80’s villains go, you couldn’t ask for smarmier candidates than Ronny Cox and Miguel Ferrer, both are scene-stealing wonders as executives that stretch their roles into high camp. Originally given the dreaded X rating for its copious amounts of gore, the restored film is pretty graphic but given the package it’s delivered in there’s a way to laugh off some of the more squirm inducing moments. A fun movie to revisit…especially for those of us that remember when the film was first released. Review: Here’s a math riddle to start my review of the sequel to 2009’s re-boot of Star Trek. What do you get when you add well-formed characters that evolve, solid special effects, an interesting villain, and a highly anticipated second chapter in a historic franchise? Well…Star Trek: Into Darkness of course. In movie math, this sequel really has it all when you look at what makes a summer blockbuster and its thanks to a dedicated production team that have gathered the right people that the movie flies as high as it does. After the re-imagined Star Trek was such an orbital hit when it was released four years ago a sequel was greenlit before opening night audiences were tucked safely in their beds. Everyone was eager to see the further adventures of the revitalized crew of the Starship Enterprise…but little did people realize that the wait would be a little longer than expected. While director J.J. Abrahams went right to work on another film for Paramount (the way underappreciated Super 8) screenwriters Roberto Orci, Alex Kurtzman, and Damon Lindelof started to lay the groundwork for the follow-up film. Turns out the subsequent four years was well worth the wait because Star Trek: Into Darkness represents a carefully formulated film designed for maximum impact for fans and the general movie-going population alike. While some knowledge of the previous film is nice, it’s certainly not a requirement to enjoy what Abrams, Orci, Kurtzman, and Lindelof have thought up in this mostly stand alone entry. Opening in the middle of a breathless rescue mission on a primitive island, the crew of the Starship Enterprise hit the ground running (literally) as they race to stop a volcano from wiping out the native people. This is the one scene where the 3D technology works the best and I found myself instinctively dodging as spears fly by and towering plant life creep out. 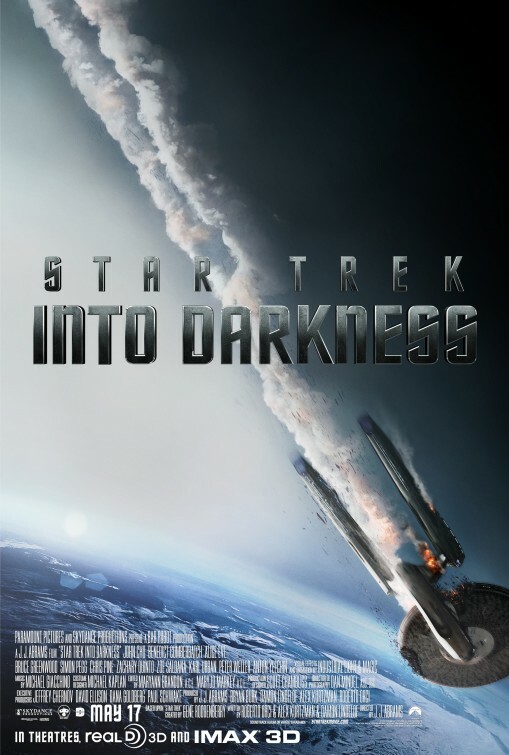 With Kirk (Chris Pine, People Like Us) taking a hit for his actions in this mission, hard feelings develop between not only Kirk and Spock (Zachary Quinto) but also Spock and his lady love Uhura (Zoe Saldana) who questions his feelings for her. When the Federation is attacked by a mysterious figure (Benedict Cumberbatch) resulting in the death of a featured character, it’s up to the Enterprise crew to track him down and avoid dissention from within. Moving at a breakneck speed, I found Star Trek: Into Darkness to be slightly superior to its predecessor mostly because it feels like the characters were allowed to expand and breathe a bit more in this film. While there were some colorful touches in the original (most notably Simon Pegg’s brilliant Scotty) there seemed to be a little tentativeness in the rest of the cast to truly make the roles their own. That hesitation doesn’t exist here and instead we have actors like Pine and Quinto stepping up and owning their interpretations of characters that have been around for four decades. There was a lot of smoke and mirrors around Cumberbatch’s character and how he fits into the scheme of things and while the revelation wasn’t unexpected it’s thanks to Cumberbatch’s steely performance and unlikely choices that makes some of the secrets revealed so much fun. (Early reports had Benicio del Toro being thought of for the role…which wouldn’t have been nearly as good). Cumberbatch even manages to pull a little bait and switch action keeping us guessing for a while where his loyalties really are. Abrahams seems to be the kind of filmmaker that Michael Bay (Pain & Gain) only wishes he could be, delivering a well-paced and handsome looking sci-fi stunner that builds and builds to a dynamic finale where a lot of expectations are thrown out the window. Though this updated franchise will continue on more missions, it seems likely that Abrahams won’t be in captain of the ship moving forward thanks to his deal to direct the next Star Wars film for Disney. Here’s hoping that the next director continues on with the forward thrust that Abrahams and company have provided. Thoughts: J.J. Abrams worked wonders with his 2009 reboot of the Star Trek franchise ny bringing in a fresh faced cast ready for the challenge and tapping into his highly successful television scribes, he brought the series in a new direction that still retained the feeling of the original series. A sequel to that mega-hit was inevitable but instead of rushing things, Abrams has taken his time to get Star Trek Into Darkness into theaters. The first teaser (billed as a teaser announcement) is an exciting mix of expected space age wonderment and some mysterious clues as to where the crew of the starship Enterprise would be headed next. As a serious fan of anything related to outer space, this is one of my highly anticipated films of 2013.